NYC Health + Hospitals/Elmhurst has opened a newly renovated Behavioral Health unit designed to meet the special needs of geriatric and frail patients, the hospital announced today. Located on the hospital’s 11th floor, the new unit can serve up to 11 inpatients, providing a warm and welcoming atmosphere in a setting designed for individualized care and enhanced safety for a particularly vulnerable population. The new unit features specialized amenities for patients coping with both physical and mental health challenges. 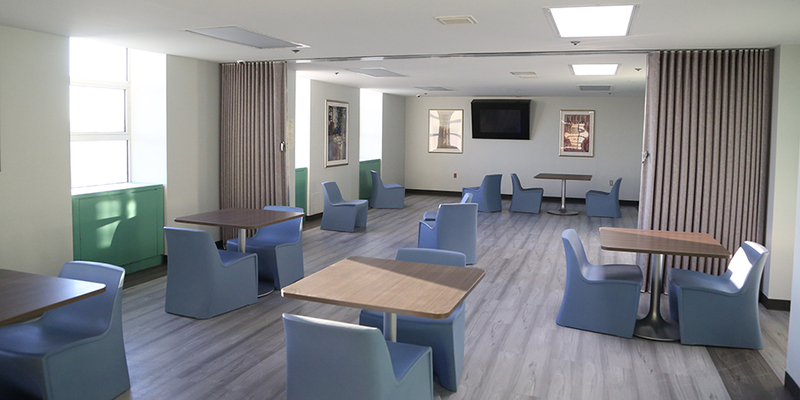 To address the physical challenges of a geriatric or otherwise frail population, the unit has skid-free flooring to decrease the risk of falls, handrails in the bedrooms and lounge/day area, chairs that help lift patients to a standing position, and raised toilet seats. The lounge/day rooms are bright and spacious, with a calm and inviting tone, designed to reduce the anxiety that many patients with behavioral health needs experience. To increase safety at night, patient rooms have functional night lights, and bed alarm technology is in place. A therapist is assigned to the unit to provide appropriate group activities. The renovation project cost $750,000. For more information on Behavioral Health services at NYC Health + Hospitals/Elmhurst, please call 718-334-1259. NYC Health + Hospitals/Elmhurst is a major provider of hospital and ambulatory care services in the borough of Queens. The 545-bed hospital is a Level 1 Trauma Center, an Emergency Heart Care Station, and a 911-Receiving Hospital. It is a premiere health care organization for key specialties, including surgery, cardiology, women’s health, pediatrics, rehabilitation medicine, renal services, and mental health services. Last year, the hospital’s robust primary and specialty care practices handled nearly 700,000 ambulatory care visits and its emergency medicine teams responded to more than 130,000 emergency room encounters.